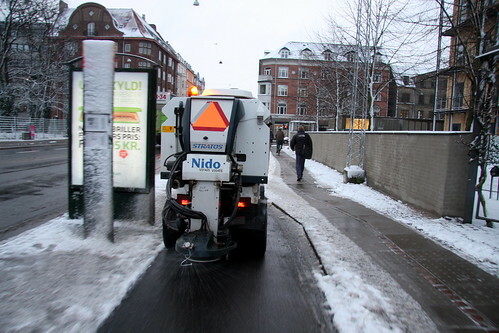 Morning rush hour in Copenhagen after a night with snowfall. In the city there was only about 8 cm but the snow continued falling. 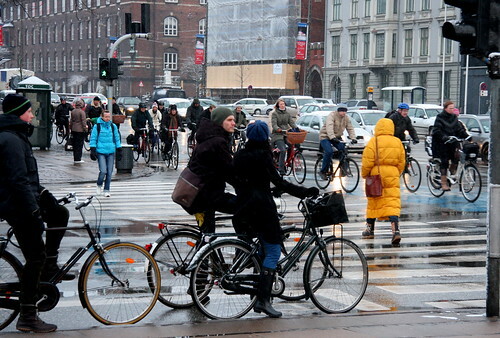 Most of Europe has been hit by heavy snows but Copenhagen has been spared until now. Snowmen have been constructed across the nation in tribute. On the bike lanes, 400,000 cyclists just get on with it and head off to work and school. I drafted behind a snowplough/salter this morning on my way to work. The salters started hitting the bike lanes last night - before the snow started falling - and the snowploughs picked up where they left off when the snow finally came. The lanes were cleared of snow when I went out to the bike shed at about 08:00. After all, 400,000 people have to get to work, so it wouldn't be very good if the lanes weren't cleared.